Shepperton Studios, London — SphereVision released SphereVision Project suite, designed to bring together 360-degree imagery with site-specific information such as still photography, documents, and maps. Complete with a modularized project builder and easily distributable viewers, the desktop software suite includes three brand new modules — Virtual Reality, Geospatial, and Timelapse Capture. 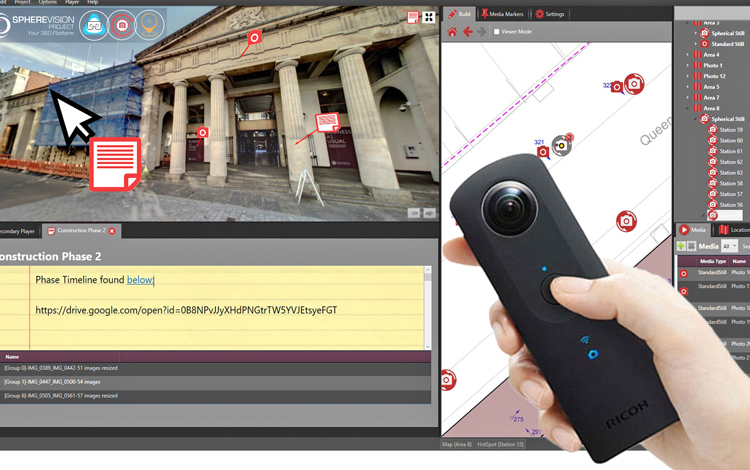 SphereVision Project also includes a range of other new features and functionality including an automatic 360 tour generator, user-defined iconography and interactive web links. SphereVision Project harnesses the power of virtual reality utilizing the HTC Vive headset. Users can experience remote sites, immersing themselves in full 360 imagery, and access embedded document and media files. SphereVision projects can also be distributed through standalone VR viewers, enabling clients to utilize this technology for presentations, site familiarization and health and safety briefs. Real world context can be added to SphereVision projects with the use of georeferenced images, such as aerial photography, or maps. SphereVision Geospatial allows users to import GeoTIFF files or link directly to OpenStreetMap data using intuitive workflows. Geospatial metadata, from many mobile and static mapping location-based services, can be automatically extracted ready to spatially reference new SphereVision projects. SphereVision Timelapse allows for the display of multiple 360 captures across a project time-line. Images can be easily combined into a single media type and different epochs navigated to compare project progress, site condition or feature location through time. A comparison image slider further enhances functionality allowing projects to be ‘rolled back’ or ‘scrolled forward’. Additional functionality on offer from SphereVision Project includes smoke layers, media filters, a user defined layer system and iconography, HDR capability, video hotspots, media links and PDF integration.